DID SYLVIA JUST LAY A TRAP FOR KHAW? In Parliament, WP’s (Workers’ Party) Sylvia Lim pressed the gahmen to learn from Bhutan. The country enjoys a high gross national happiness index and has an admirable approach to growth. So Minister Khaw Boon Wan (two days later) responded – by sharing his experience in Bhutan, and his observations. It’s a very long response, but the gist is that the country of Bhutan is no paradise. It was published on AsiaOne. And boy oh boy, looks like Sylvia just offered a borrowed foot to Minister Khaw’s mouth, you know, a bit like 借刀杀人 because seems Minister Khaw has just gotten a reply, (allegedly) from a Bhutanese! Wow, this is interesting. 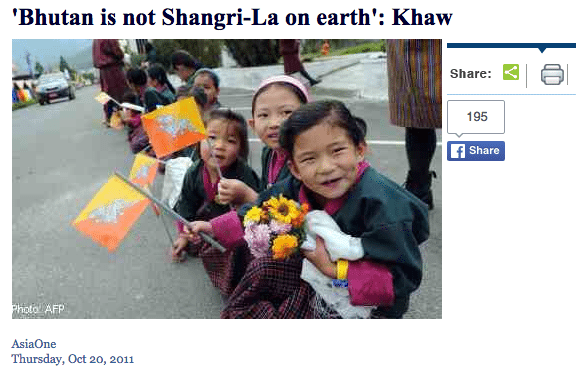 An ordinary Bhutanese wrote on his blog a reply to Khaw Boon Wan’s comment that Bhutan wasn’t the last Shangri-la on Earth. This guy goes by the name of PasSsu. I was not surprised when you said Bhutan is not the last Shangri-la on Earth, because I had a friend from your country who found Bhutan only “full of mountains and valleys”. When you visited Bhutan, what did you expect? Those flying mountains you saw in Avatar? or Every Bhutanese merrily dancing in designer clothes? Well, you must have at least expected fancier cars and taller buildings but we only have taller mountains (not flying ones) and thicker forest (truly natural). I am not surprised even when you said “Most of the time, I saw unhappy people, toiling in the field, worried about the next harvest and whether there would be buyers for their products.” because I heard a proverb in school that goes, “Two men looked through the prison window, one saw the mud and other saw the horizon”. I am only surprised that you have spend “Most of your time” in Bhutan looking in the fields. I am amazed at your ability to figure out whether the people are happy or unhappy just by looking at them- O’ you even knew they were “worried about the next harvest”. No wonder you country export human resources. I visited your wonderful country sometime ago, and it felt like a city from the future. The transportation system held me spell bound, Cleanliness of the street is so much that I didn’t find a fragment of dust on my shoes after walking for the hours, Every building and car looks new, and there is no question about the civic sense among the people. Four days after I landed in Bhutan I woke up and started sharing the stories of your wonderful country- yes it took me four days of sleeping to shake of the hangover of many sleepless nights in your 24X7 country. I read the amazing history of your country and thought to myself, if Bhutan’s to develop, Singapore can be our vision. But since you questioned the presence of happiness in Bhutan, let me answer by telling you few things that you overlooked when you visited my country. Those people you saw in the fields weren’t unhappy, if you have gone closer you would have heard them singing and enjoying the social lives, perhaps you won’t understand that. If you have spent a little longer time watching them, you would have seen and a woman with basket on her back and holding arms with several children coming with steaming food- we don’t have McDonald or KFC. Then everybody will sit down to eat their lunch, laughing and joking, feeding babies, for over an hour- you wouldn’t have had so much time to sit and watch I know, times means money in your country. But we have luxury of time. People don’t worry “about the next harvest and whether there would be buyers for their products.” In fact, we don’t do much commercial farming, we do most of them to keep with the tradition. And when the sun sets, doesn’t really matter what time, people leave for their homes where they have a large family waiting. Large family because we don’t chase away our children when they become 18 or children cast away their parents when they age. We don’t need Health Insurance to survive, no have to go for Education Loan for educating our children. We don’t hang the drug users, we counsel them to hang on to their lives, we don’t have to have a job to survive, and when we fall sick even the furthest cousin comes to attend without having to update Facebook status. If you reread our history you will find that our wise kings have hidden us from the outside world so that we could remain the way we are today. If we start mining our mountains and lumbering our forests, we can become Singapore in a year but no matter what you do you can never become Bhutan. It is far too difficult. We shall be the last breath of oxygen on earth. Did Sylvia just lay a trap for Khaw to step into? We await Minister Khaw’s next move. Bhutan was mentioned several times in this House. I visited Bhutan a few years ago, and met a good cross section of the people, from the Prime Minister, the ministers, the Chief Monk, to civil servants and ordinary folks. Of course, I am not an expert on Bhutan but the westerners’ romanticised version of this ancient Kingdom does not fit the reality of what I saw. 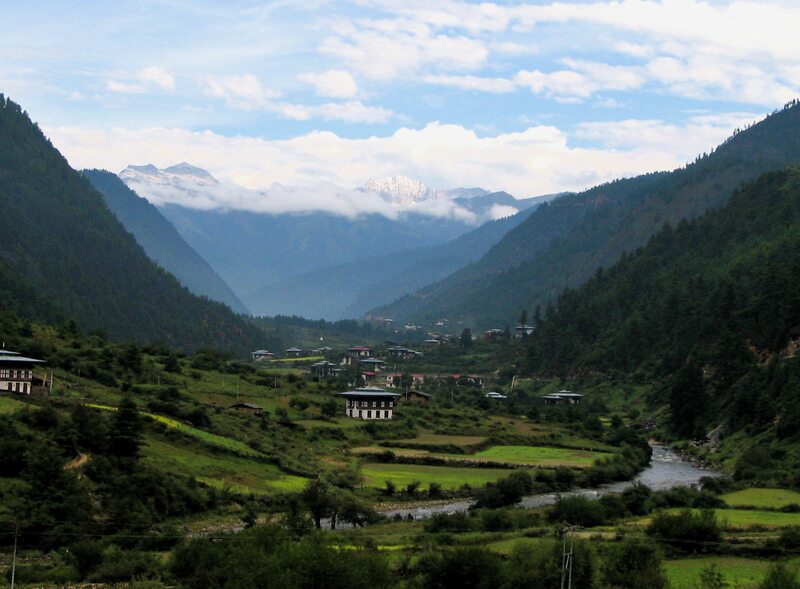 Bhutan is not the Shangri-la on earth. The Chief Monk of Bhutan is a learned man, an enlightened monk and passionate about saving lives in the spiritual sense. He knows Singapore well, visiting us regularly to meet up with his devotees and friends. I asked him what brought him to Singapore on his first trip. He explained that Singapore had cropped up during one meditation session. He was, at that time, planning to build a Buddhist University. He was concerned with negative influences that inevitably would come with globalisation, and felt deeply that the only way out was to imbue his people with traditional values, religious practices and cultural norms. To build his University, he needed money. He conceived a plan to build a big Buddha statue, to draw in paying tourists and visitors and hence funds. The Bhutan Government allocated a good piece of land on a hill overlooking the capital, but said that he would have to raise the funds for construction. As he meditated on the way forward, he apparently saw glimpses of Singapore, a country he had then not known much of. He took his first flight to Singapore and landed at the Changi Airport at midnight. What followed was quite incredible. He left the departure hall and jumped into the first taxi that came along. The driver asked for his destination. He said “a clean cheap hotel”. The driver seemed to know where to send him to and he checked in for a 3-day stay as that was the amount of money he had in his pocket. The next morning, over breakfast, a group of people sitting next to his table, went up to him and posed some questions on Buddhism. He must have given a good reply and they ended up with a long chat. As it turned out, the owner of the hotel was among this group of people. He offered the monk free hotel accommodation for as long as his visa permitted, and asked him to give dharma talk to a group of devotees who were his friends. That started the series of the monk’s subsequent visits to Singapore. In time, the group of devotees grew and many in gratitude supported the Buddha statue project. My trip to Bhutan was to check out the Buddha statue project. The Chief Monk was gracious and kept me company throughout. We visited several ancient temples, in the city and in the villages. Although a strictly private visit, the Prime Minister who knew of my visit from the Chief Monk, spent some time with me. Over several days, I met up with most of his Ministers, including my counterpart Health Minister at that time. The Bhutan Ministers know a lot about Singapore. They have studied us very closely. They are keen to port over some of our public policy solutions to Bhutan. The Health Minister himself had spent months training in the Singapore General Hospital and remembered his stint in Singapore most fondly and could rattle off our 3Ms financing framework. My Bhutan visit left some deep impressions. First, the plight of a tiny nation. How do you make yourself relevant in the harsh world of big nation politics? Or simply making your voice heard? ST’s Europe correspondent, Jonathan Eyal, wrote a perceptive piece just today on the plight of small countries, quoting the example of how tiny Slovakia, with a population of 5.5 million, was currently being unfairly treated by their big EU allies. They are being told to contribute to the bailout fund, “to bail out countries which are far richer, and which have only themselves to blame for their current predicament”. As Jonathan put it “small countries are supposed to know when to shut up and simply do as they are told”. Second, the hard reality of living next to giant neighbours. I spoke to the Cabinet Secretary to understand their economic structure: what were their revenue sources, how did they make a living? Most of the Government income was aid and handouts from a giant neighbour next door. The second largest income item was sale of hydroelectric power to the neighbour. I asked if they were paid international market rate. From his body language, I gathered that altruism or even fairness did not feature much in Government-to-Government relations. Third, the challenge of making yourself relevant in a globalised world. Being landlocked between India and China, they know their options are limited. The talented are leaving for opportunities elsewhere. The economic opportunities at home are few. The tradition is for the first son in the family to be a monk and the second son, a civil servant. The rest of the children will just have to fend for themselves, mostly in the farms. Tourism is a possible engine of growth. But they have seen how mass tourism has ruined their neighbouring country environmentally and culturally. They are determined not to go that route. Fourth, self-determination and self-reliance bring dignity and pride. If survival means pandering to the wishes of others, it is no fun at all, let alone, happiness. This is so at the national level; it is equally true at the personal level. They have studied us because Singapore is also a tiny nation, living next to big neighbours. We have successfully transited from Third World to First and managed to create a functioning and harmonious society for our people. In their mind, Singapore could well be the Shangri-la and they want Bhutan to emulate Singapore. Members must have had such an experience before. Mr Zainudin’s residents in Bishan will soon be able to experience it regularly when the Bishan Park’s ABC programme is completed. In the Bhutan villages, I saw well-to-do tourists crossing beautiful mountain streams, with expensive Nike shoes in their hands. They were happy. I saw Bhutan children enjoying the river like all children do. They had no sandals in their hands for they could not afford any. But they seemed happy, with angelic innocence, without any worry. I met and heard about foreigners who volunteered in Bhutan: many Singaporean retired teachers bringing IT to the schools, doctors providing immunisation and eye care for the villagers. They were happy as they found meaning in what they were doing, helping others. But most of time, I saw unhappy people, toiling in the field, worried about the next harvest and whether there would be buyers for their products. The Health Minister asked me to help get ambulances and medicine for their villagers. The Chief Monk is a sincere man. He sees the onslaught of the Internet and he strives to save the soul of his people, to get them to understand the meaning of life, and how to live it for others. He keeps a close tab on developments here in Singapore. A week before our General Election, he passed a message that “May 7 is an auspicious day, for good people”. So all of us here in this House, who won the mandate on May 7, are good people. Congratulations! It is now incumbent on all of us, to do our best to make the lives of our people better, not through empty rhetoric, sound bites or mindless giveaways. The challenges of a tiny nation are real and huge. We are not a continental economy like the US or China. We live in a troubled and troubling region. Against all odds, we have done well in the last 50 years when we had so little. We should be able to do even better, now that we have much more. The important thing is to stick to the basics and remember the values of hard work, prudence, self-reliance and meritocracy that have brought us here so far. Our public policies are founded on such values. They are well-intentioned for the good of Singaporeans, both in the current and future generations. They are not perfect, but they are not bad. We do however need to adjust them from time to time, in keeping with changed circumstances and in the light of experience. For example, against the current environment of rising cost, I see the need to make major policy adjustments to help the low and the middle classes cope better with the higher cost of living. But we must be mindful that we do not mindlessly slip down the welfare route which has now plagued Greece and which threatened the rest of Europe and the world.